A lovely week, a wonderful week. Even though several challenging aspects will stir things up, I can’t help but feel upbeat. This is a Goddess week! The Sun enters the sign of Libra on Tuesday, marking the Vernal Equinox in the Southern Hemisphere and the Autumnal Equinox in the Northern Hemisphere. The sign of Libra is ruled by the planet Venus, the Goddess of beauty, love, and material success. The Equinox (equal + night) is the time when night and day are perfectly balanced. This symbolizes the exact balance of inner and outer, dark and light, yin and yang, conscious and unconscious, waking and sleeping. This change of Season is heralded by the Hindu celebration of Navratri, nine days dedicated to the Goddess in her nine forms. Navratri is one of the biggest and most important Hindu celebrations. With over 1 billion Hindus celebrating for nine days, the whole world can’t help but feel the vibration. 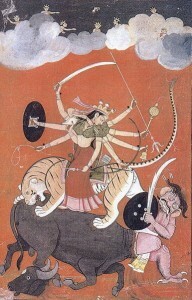 The Goddess is worshipped for three days as Durga, the Goddess of purification; for three days as Lakshmi, the Goddess of spiritual and material wealth; and then for three days as Saraswati, the goddess of knowledge. In India harvest season begins at this time and as mother earth is the source of all food, the Mother Goddess is invoked to start afresh the new harvest season and to reactivate the vigor and fertility of the soil by doing religious performances and rituals which invoke cosmic forces for the rejuvenation of the soil. 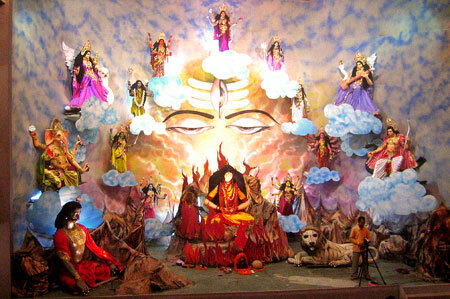 On the day of Dasha-Hara, statues of the Goddess Durga are submerged in the river waters. These statues are made with the clay & the pooja [ritual] is performed with turmeric and other pooja items, which are powerful disinfectants and are mixed in the river waters. This makes water useful for the farmers & yields better crops. On the ninth day, Sunday the 27th, business people give the tools of their trades rest and worship them, asking for blessings for these vital allies for the coming year. It’s a great time to stop and thank our computers, generators, automobiles, pens, paintbrushes, backhoes, or whatever tools we use. And then the 10th day of the celebration, on Monday the 28th, is considered the best day of the year to begin any business venture. This day is so powerful, it overrides the Retrograde Mercury considerations. If you want to begin your venture, go for it! The Moon is waxing this week to the quarter point, passing through the New Moon and Crescent phases. Normally, this is the phase to set new plans in motion, start new ventures, and carefully shepherd the initial growth. We’re still under the Mercury Retrograde period until September 29, so it’s best at this time to focus on reinvigorating a project you may have initiated sometime in the past rather than beginning something brand new – unless of course launch date is September 28th, with blessings from the Goddess. On Tuesday, Retrograde Mercury conjuncts Saturn in Virgo. Remember last month when we began our process of business planning? With the retrograde Mercury, now is a good time to pull out that work and take another look at it. This energy will help you revise your initial plans to be more practical. Take advantage of this aspect to map out the particulars, put them on a spreadsheet, or get all the details down on paper. This aspect is also about careful communications. Your exchanges carry a lot of clarity and wisdom on Tuesday, but can be somewhat paternalistic in style. If you need to have a difficult business conversation with someone this week, use every discipline to be precise and responsible for your side of the situation. Then all will go well under this transit. On Wednesday, the Sun, which has just entered Libra, will square Pluto in Capricorn. And on the same day Mercury will oppose Uranus. You may find this a difficult balancing act, walking a tightrope to please everyone around you. You may be the fulcrum point between defiant internal stakeholders, such as employees, and shaken external stakeholders, such as customers. Issues you’d rather not look at in the realm of your business structure or financial status could be suddenly and explosively revealed. Don’t run for cover! Your leadership is needed to sort through the situation, as difficult as it may be. The Mercury Uranus opposition will give you a cool head and clarity of insight to deal with whatever suddenly erupts, although it may be the worst day of the Mercury Retrograde period for problems with technology. If those around you come to you with rebellion on their mind, use your cool head to listen carefully. Respond to their insights and truly consider their suggestions. Revisit and revise accordingly. These are powerful energies and the opportunity is there to let go of what must be replaced. Count on the Goddess this week to gently but thoroughly purify some aspect of yourself or your business as we head into this next season. The stress of these two mid-week transits can be hard on your body. Take it easy, carving out time for your own celebration of either the return of Spring, or the abundance of the harvest. This entry was posted on Sunday, September 20th, 2009 and is filed under Astro4Business Week. You can follow any responses to this entry through RSS 2.0. You can leave a response, or trackback from your own site. I just love these weekly reports. I took your advice for Tuesday and spent the day tightening up the course materials for my upcoming woodblock class — materials I had loosely compiled several weeks ago. Whether it was the power of suggestion or a true energetic assist from the planets, no matter. I got it done and I’m ready for the class.